George Graham Reviews Indigo Girls' "Become You"
In the late 1980s, there was a brief moment when folk-oriented singer-songwriters enjoyed some popular success in the mass media with hits from Susanne Vega and Tracy Chapmen. That opened the doors for quite a few folkies, especially women. Of course, as far as the commercial media were concerned, that door was quickly slammed shut to make way for more disposable fads. But since then, the singer-songwriter scene has been remarkably active, though under the radar of the pop music industry. One musical act that made an appearance during that momentary lapse in enforced mediocrity, was the duo calling themselves Indigo Girls. Amy Ray and Emily Saliers made their first appearance on record with an independent release in 1987, and have remained a durable presence on the music scene ever since, somehow managing to stay on a major record label, enjoying surprising popularity, in a time when thoughtful artists are being purged wholesale from the industry. Indigo Girls are now out with their ninth regular album, called Become You. Based in Georgia, Ray and Saliers are an interesting team. They have always written songs separately, and each has a distinctive style -- Amy Ray is more the rocker, and a bit harder-edged lyrically, while Emily Saliers is the more folky in sound, and a bit more romantic in her wordcraft. But both also continue with the political and social activism for progressive causes that has been a hallmark of folksingers since Woody Guthrie. This album however, is a decidedly more introspective and personal one. It also marks a return to more acoustic, folk-oriented musical territory, after their last two studio releases tended toward an edgier, alternative-rock influenced sound. It also reunites them with Peter Collins who produced their classics Rites of Passage and Swamp Ophelia. They recorded the new CD in their hometown of Atlanta and used members of their regular touring band, so the result has a much more comfortable, unpretentious sound, that makes Become You their best album in years. 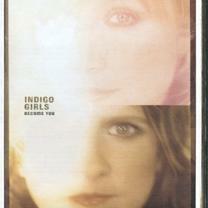 There are some electric instruments, but this new CD is a nice reminder of what Indigo Girls are all about musically. The duo is quoted as saying that even before their last release, the heavily rock-oriented Come on Now Social, was issued, they were thinking about going back and doing an acoustic album, given the right songs and circumstances. Become You is thus a CD that reflects Ray and Saliers at their most honest and relaxed -- being in their home town, and thus being able to go home every night after working in the studio, working with musicians who have been their long-time colleagues on the road, and in many cases recording live in the studio. So while the songs' lyrical content may not always be the pinnacle of their work, the performance and musical atmosphere make this the album long-time Indigo Girls fans have been wishing for. As usual, the CD is equally divided between the songs of Ms. Saliers and Ms. Ray, and their fans are not likely to need to consult the composers' credits to determine whose song is whose. But both do take a decidedly more romantic direction, with most songs about relationships in various states, in many cases, states of disrepair. But there are also the fine songs that can apply to larger issues. Joining Ray and Saliers are keyboardist Carol Isaacs, bassist Clare Kenny and drummer Brady Blake. Guests include backing vocalist Michelle Malone, a singer-songwriter in her own right who has worked with Indigo Girls previously, and saxophonist Dan Higgins, who make a somewhat unexpected appearance on one track. Despite the acoustic underpinnings of the CD, it is surprisingly wide-ranging stylistically, running from Memphis-influenced soul to roots rock with an accordion, to jazzy, to one track with a string orchestra. The band is quite tasteful in their playing -- Ray and Saliers said they started writing the songs by themselves on their acoustic guitars, then brought their band members in and invited them to play along, and in most cases the parts they come up with were what ended on the album. The duo themselves are also in especially good form vocally, perhaps another upshot of the more comfortable circumstances of the recording of the CD. While Indigo Girls' quality of writing has remained high over the years, the duo was definitely overdue for a return to their folk-oriented musical roots. They have done that with plenty of class on their new CD Become You, easily their best-sounding album since the mid 1990s. Together now for the better part of two decades, Amy Ray and Emily Saliers form one of those great partnerships enhanced in part by their musical differences. The relaxed, hometown atmosphere of this recording is very evident in their performances which further enhances the songs, and while the direction is more acoustic, the overall production is pleasingly eclectic. Our grade for sound quality is about a A-, at least an order of magnitude better than their horribly compressed last CD, Come on Now Social. The mix on Become You is puts everything in the right proportions, and the dynamic range is decent. But some of the instruments, and especially the vocals individually lack some clarity, and there is a little distortion from time to time on the vocals. After turning up the musical volume over the last couple of releases, Indigo Girls have finally made the album many of us long-time fans hoped they would do.